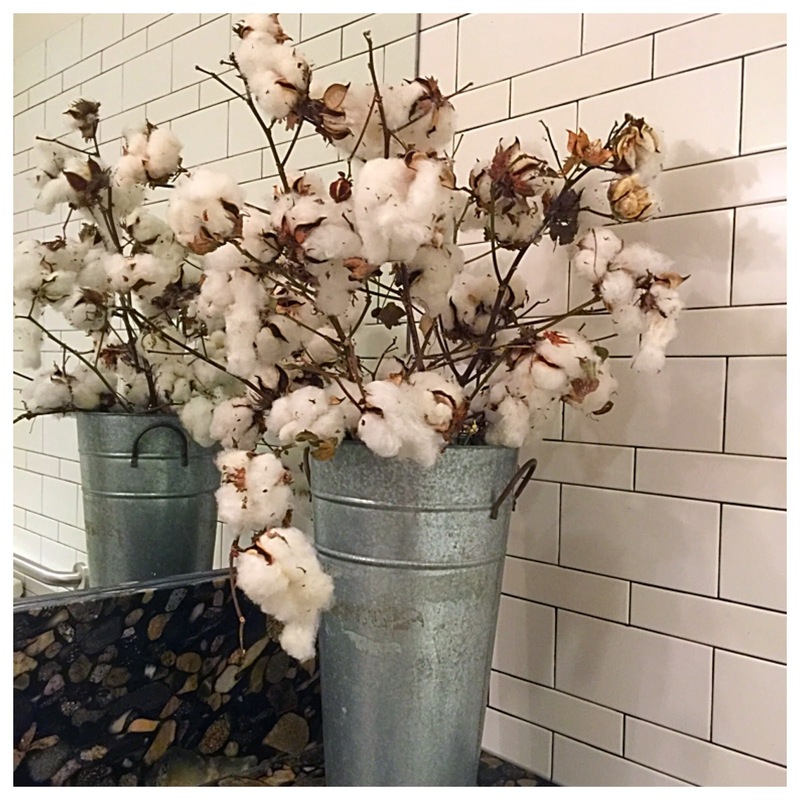 One of the most exciting culinary events that took place in Alabama in 2015, was the opening of Chef Chris Hastings' highly anticipated new restaurant, OvenBird. It was scheduled to open in September, but the opening was delayed a bit. Finally, in early October, the doors opened wide to accept the first hungry and intensely curious patrons. Located on Third Avenue South in downtown Birmingham in the Pepper Place complex, OvenBird brings even more excitement to an area already bustling with creative endeavors, from the famous Pepper Place farmers' market to home and garden design. OvenBird pays homage to fire...from Chris' childhood memories of camping with his family and cooking freshly caught trout over the open flame of his family's campfire, to Birmingham's history forged in the fiery furnaces of the iron industry. 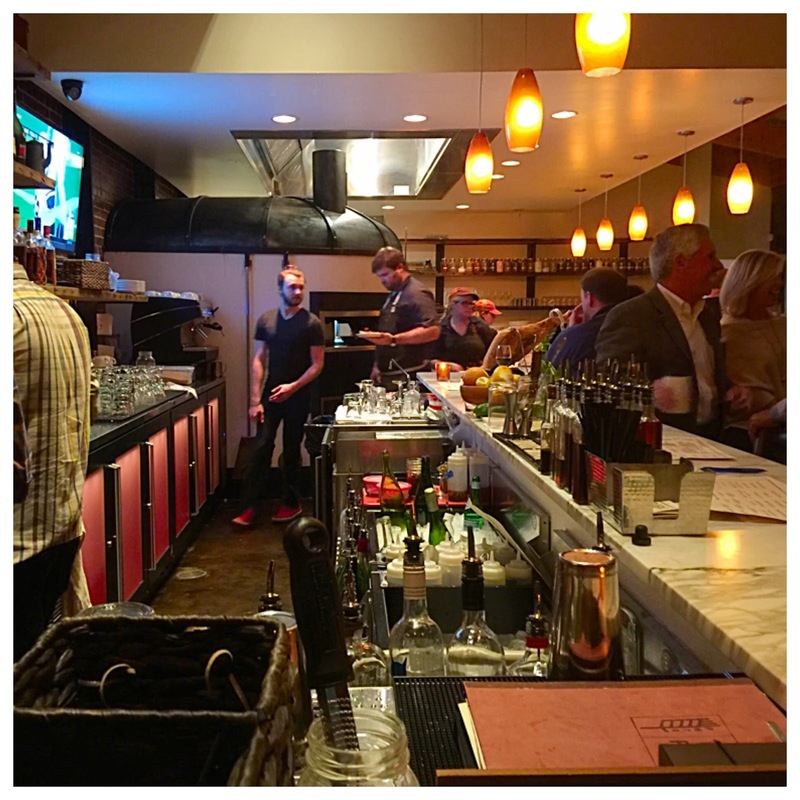 The locally sourced and seasonally inspired dishes at OvenBird are cooked over open flames, served tapas style, and based on centuries old recipes from Argentina, Spain, Uruguay and Portugal. 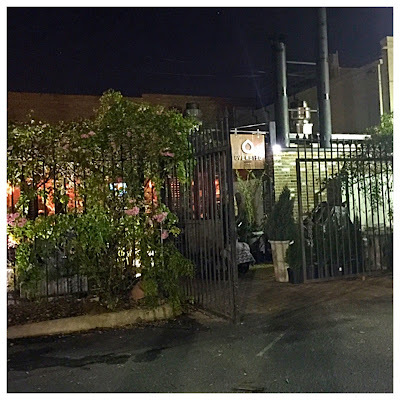 There are no gas lines at OvenBird. Those open flames literally come straight from Chris Hastings' early campfire cooking experiences. Wood fires, baby! 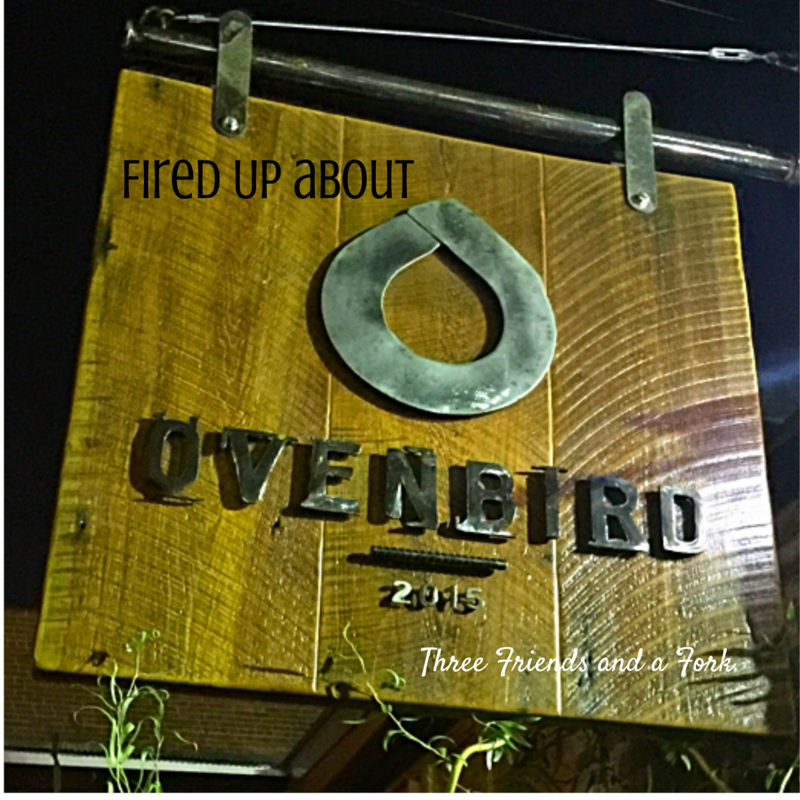 To say that Luanne and I were excited about a trip to OvenBird would be an understatement. 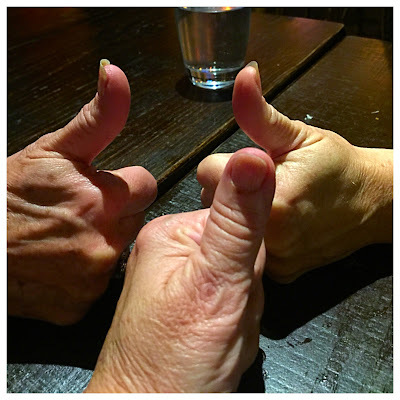 We made plans to meet our friend, Merri and wondered what culinary delights we would encounter. Lu and I arrived first, so, while we waited for Merri to arrive, we ordered a couple of the handcrafted cocktails inspired by the same cultures that influence the rest of OvenBird's menu. 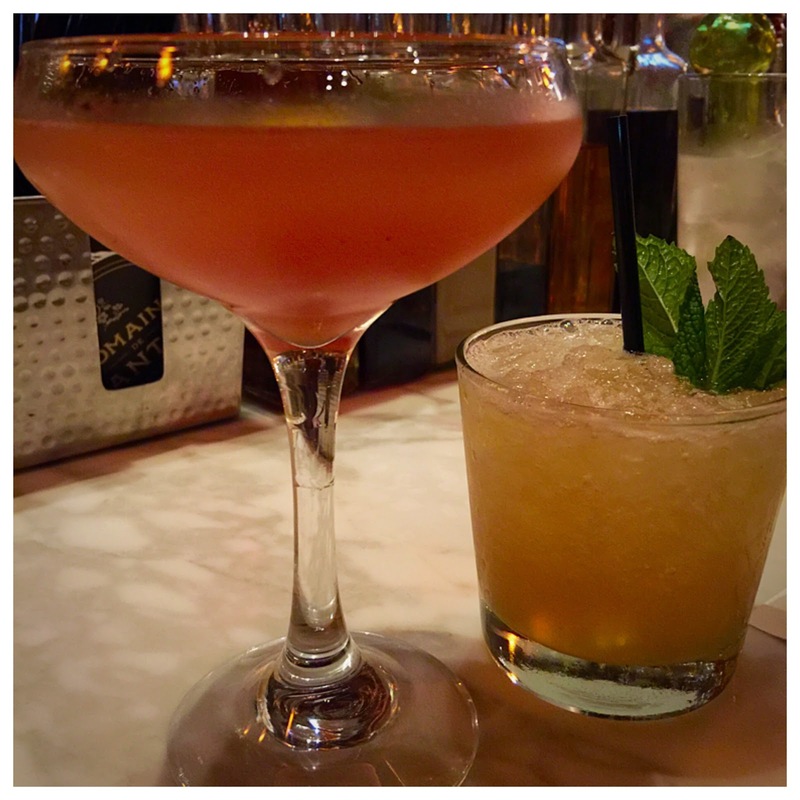 Luanne chose a concoction called the Hammer and Anvil, made with homemade Rock and Rye, tarragon spiced syrup, honey, mint and lemon. Rock and Rye, as I understand it is, in and of itself, a mixture of whiskey, rock candy sugar and dried fruit. 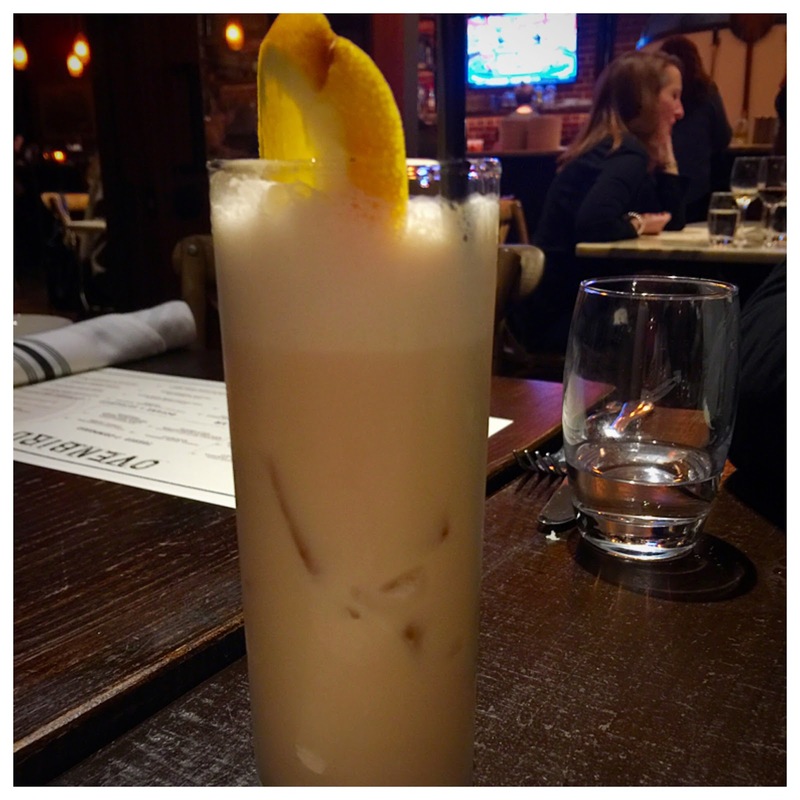 I opted for the Bee Hive, made with Cathead vodka, almond tea syrup, St. Germain and creole bitters. St. Germain is a liqueur made from elderberry blossoms. 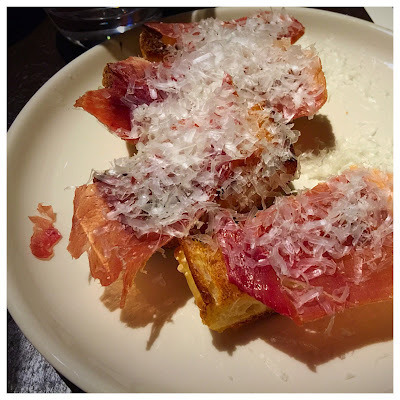 We also decided we could not wait to sample an appetizer, so we ordered a plate with super thin slices of the dry cured Spanish ham, Jamón Serrano, the buttery Spanish sheep's milk cheese, Manchego, grilled slices of crusty bread and persimmon jam. The combination was divine. While we munched on our appetizer, we were joined at our table by a tall, slender gentleman with piercing blue eyes. I was immediately struck dumb, but Luanne, being clueless, was having no such difficulty. You see, the good looking guy speaking to us was none other than Chris Hastings himself. As I choked on my words, he graciously welcomed us to "his house" and told us if we needed "anything" to let him know. I finally managed to tell him what a fan I was and had been ever since he had out-cheffed Bobby Flay on Iron Chef America, Battle Sausage, a few years ago. He said that was a pretty big thrill, which was probably something of a understatement. The whole time, Luanne is looking at me in complete bewilderment. As soon as Chef Hastings left our table, I filled her in. She immediately wanted to get him to come back so she could take a picture, but I was too star struck. 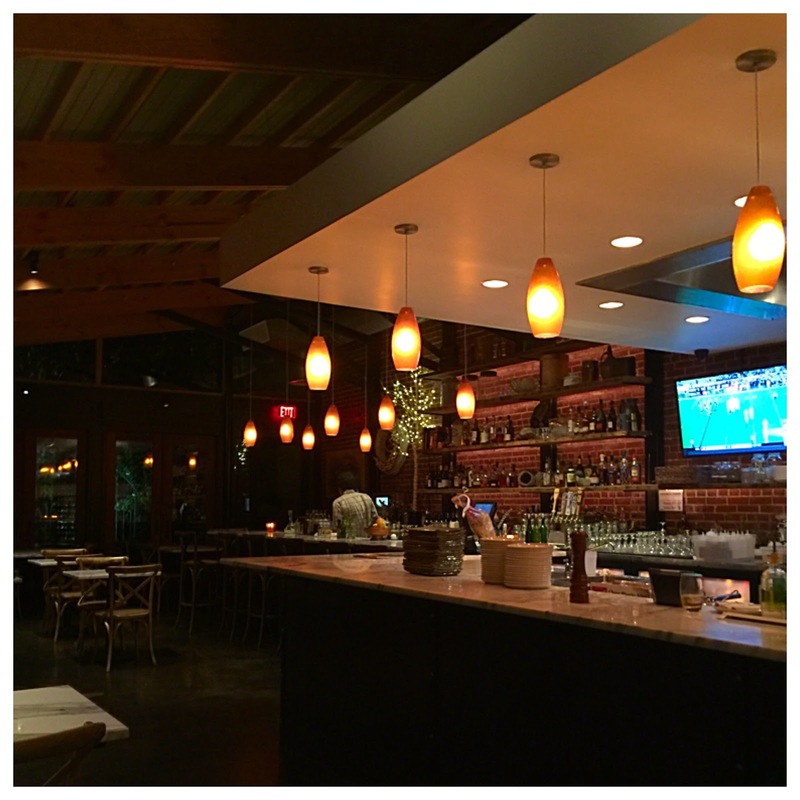 As soon as Merri arrived, we told her what she had missed and got down to studying the menu for real. As we weighed our options, Merri ordered a Bee Hive and Luanne couldn't resist trying another of the creative cocktails. This time she got a Pig Iron made from creamy El Dorado rum, cream sherry, pineapple, lime and aromatic bitters. With help from our knowledgeable server, we finally narrowed our choices down to four tapas to share. 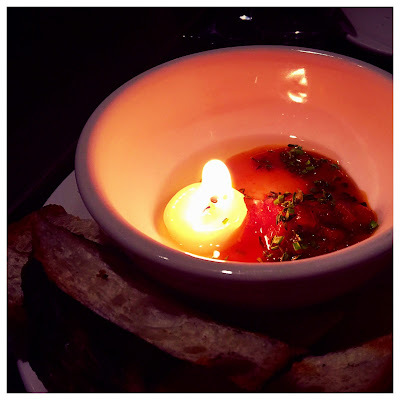 We knew we wanted OvenBird's signature dish, the Beef Fat Candle, which was literally a candle made from beef fat, sitting in a puddle of Spanish sofrito, herbs and jus. Our server told us to think of the drippings in the pan after you have just cooked a big roast. The candle arrived, burning brightly. We waited for the flame to die out and then started dipping the accompanying bread slices into the tasty puddle. It was so good! Luanne bravely wanted to try the braised goat, Merri safely settled for spit roasted chicken and, totally confused, I took our server's suggestion and ordered the beef shoulder complex. The goat was braised in a rich broth and sitting on a bed of creamy grits. It was topped with a poached egg and sprinkled with watercress. I was surprised at how much I liked it. Of course, you could probably bring me a flip flop served on a bed of creamy grits and I would like it. The spit roasted chicken was smoky and fall off the bone tender. It was piled on top of endive, braised black beans and topped with a Portuguese piri piri sauce. The citrusy piri piri was made with lemon, fresh herbs and chiles. We all loved the chicken. The beef shoulder complex was ash baked with root vegetables. 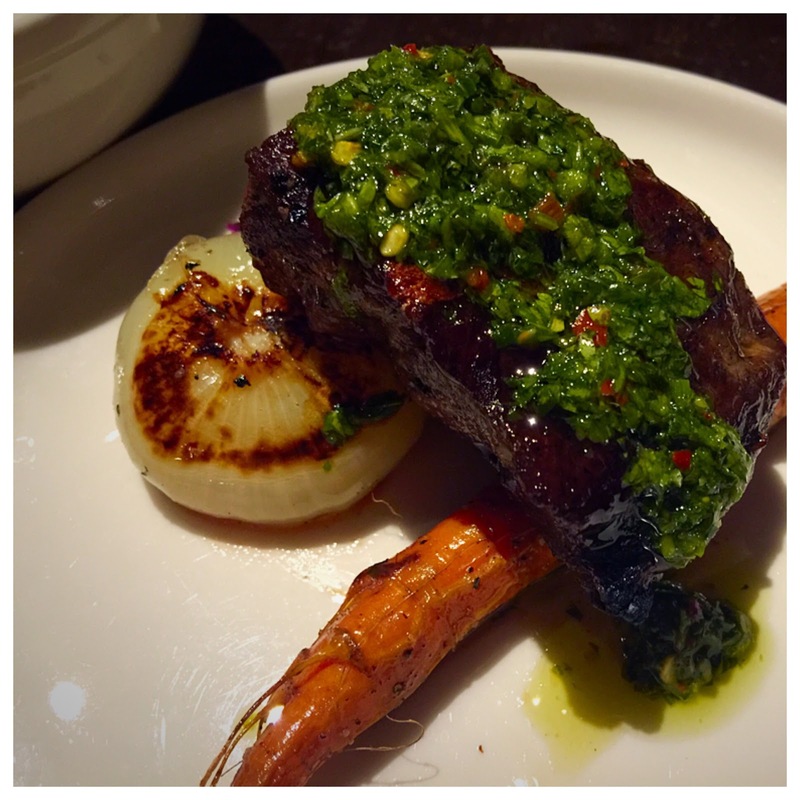 It was topped with a vibrant chimichurri sauce. That is the bright herby green stuff on top of the beef. Again, the meat was falling apart tender and absolutely delicious. Luanne and I almost fought over the carrot. Both Merri and Luanne said they loved the beef the most. I couldn't choose because I liked them all. 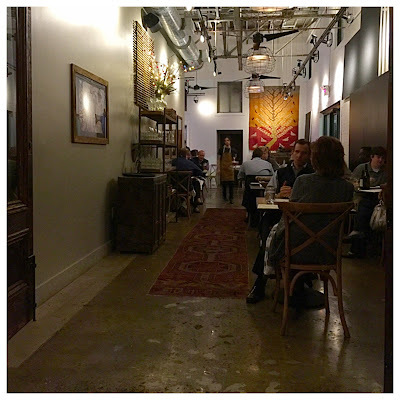 Finally, we couldn't miss an opportunity to try OvenBird's dessert situation. We chose the apple crostada in honor of Sherri. If she had been with us, she would definitely have wanted to try a fruity dessert. It was yummy. 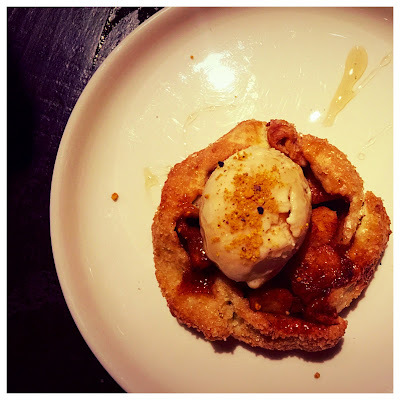 The crust was delicate and flakey, the apples were spiced with cinnamon, burnt honey and bee pollen and it was topped with a cold, creamy dollop of frozen yogurt. Oh, yes, Sherri would have definitely approved of this one. 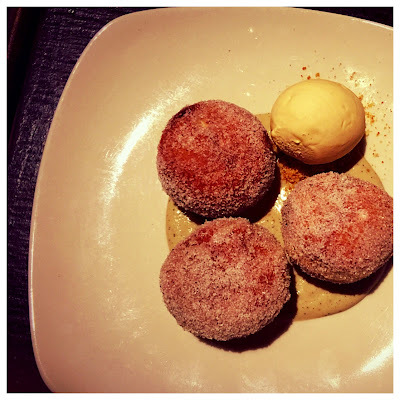 None of us can resist a beignet, so we also got an order of espresso flavored beignets, rolled in spiced sugar and served with salted caramel ice cream. They were so good! 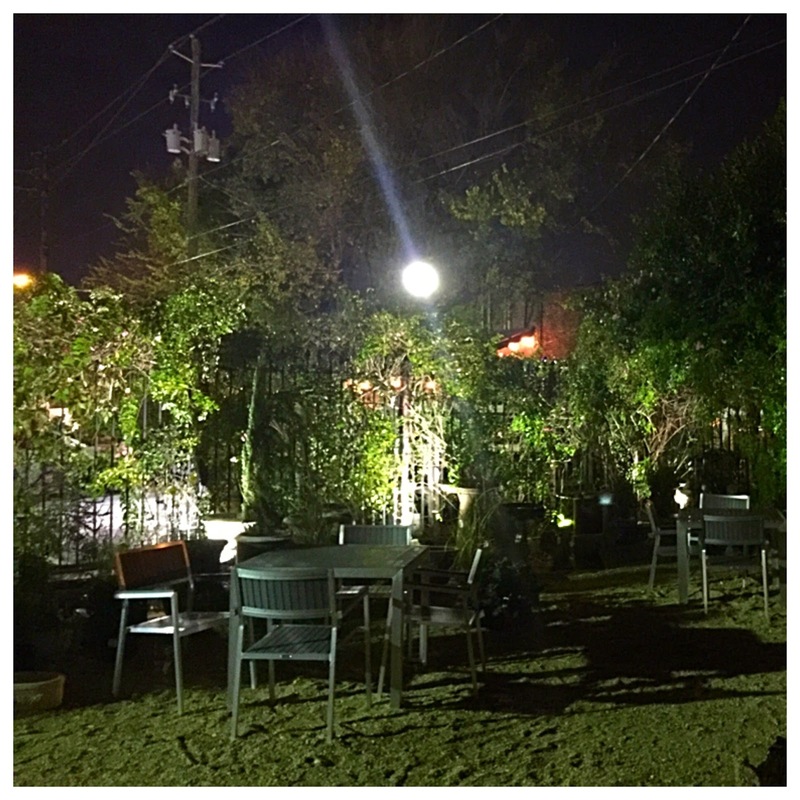 Our trip to OvenBird was a fun and delicious adventure. Getting to spend time with good friends, eating delicious and adventurous food and getting to meet Chef Chris Hastings...what more could we want! 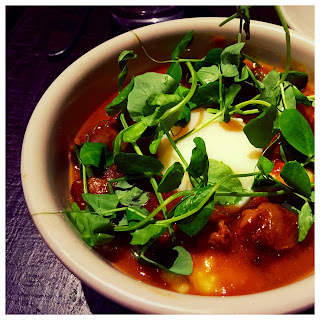 Three Friends and a Fork is so happy to give 3 fiery Yums UP to Chef Chris Hastings and OvenBird and we cannot wait to visit "his house" again!